BITSAT is a computer-based online entrance test for the Birla Institute of Technology and Science (BITS), Pilani. BITS, a deemed university, is an all-India Institute for advance education. It awards it own degrees. The Institute grants admission for its Integrated First Degree programs on the basis of BITSAT. The BITSAT is common for the Pilani and Goa campus of BITS. BITSAT is offered over a period of time and the candidate can choose the center, the day and time of his / her convenience to take the test. The Birla Institute of Technology and Science (BITS) Pilani is an Institution declared as Deemed to be University under Section 3 of the UGC Act. Admissions to all the Integrated First Degree programmes of BITS, Pilani, at Pilani campus, Goa campus, and Hyderabad Campus for the academic year 2009-10 will be made on the basis of a Computer based Online Test conducted by BITS, Pilani. 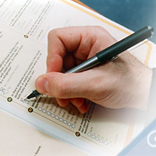 This test will be referred to as 'BITS Admission test - 2009', in short as BITSAT-2009 hereafter in this document. For admission to any of the above Integrated First Degree programmes Candidates should have passed the 12th examination of 10+2 system from a recognized Central or State board or its equivalent with Physics, Chemistry, and Mathematics. Further the candidate should have obtained a minimum of aggregate 80% marks in Physics, Chemistry and Mathematics subjects in 12th examination, with at least 60% marks in each of the Physics, Chemistry, and Mathematics subjects and should have adequate proficiency in English. Students who are appearing for 12th examination in 2009 or who have passed 12th Examination in 2008 only are eligible to appear in the BITSAT-2009 test. Students who have passed 12th examination in 2007 or earlier are NOT eligible to appear in BITSAT-2009. Students who are presently studying in BITS at any of its campuses are not eligible to appear in BITSAT-2009. The BITSAT-2009 test will be conducted on the basis of NCERT syllabus for 11th and 12th class. The detailed syllabus is given in the Annexure. Candidates may refer to the NCERT textbooks for the contents. A sample test will be made available to the registered candidates at the BITS website on which he/she can practice as many times as desired. Interested candidates should register their names for BITSAT-2009 by applying in the prescribed application form online. Complete the application form Online at http://www.bitsadmission.com and take the print out of the filled form. The completed application form alongwith the prescribed fees of Rs. 1000/- (Rs. 500/- for female candidates) should be sent to Admissions Officer, BITS, Pilani - 333 031. Details for payment of fees are available at the website while applying online.